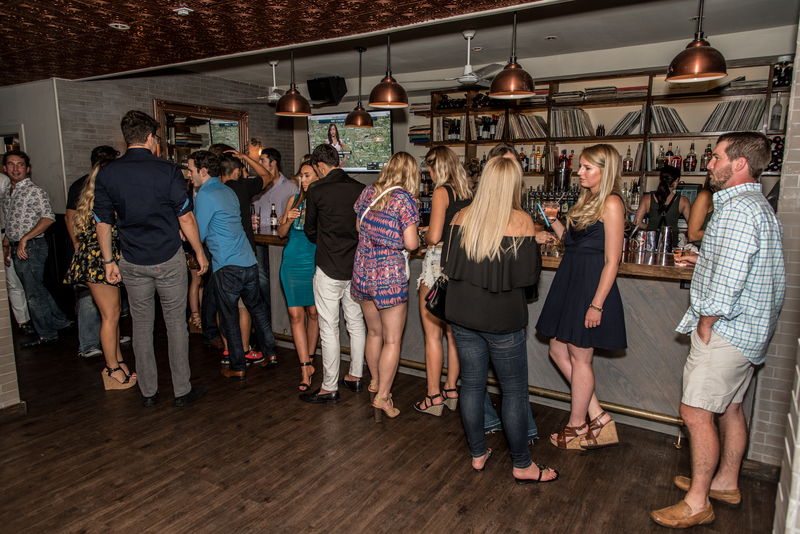 This Uptown bar boasts bottle service and two breezy patios. Just when you thought Uptown couldn’t fit another bar-and-restaurant on its light-strewn streets: enter Next Door, a cocktail den that strives to be the best of all worlds. 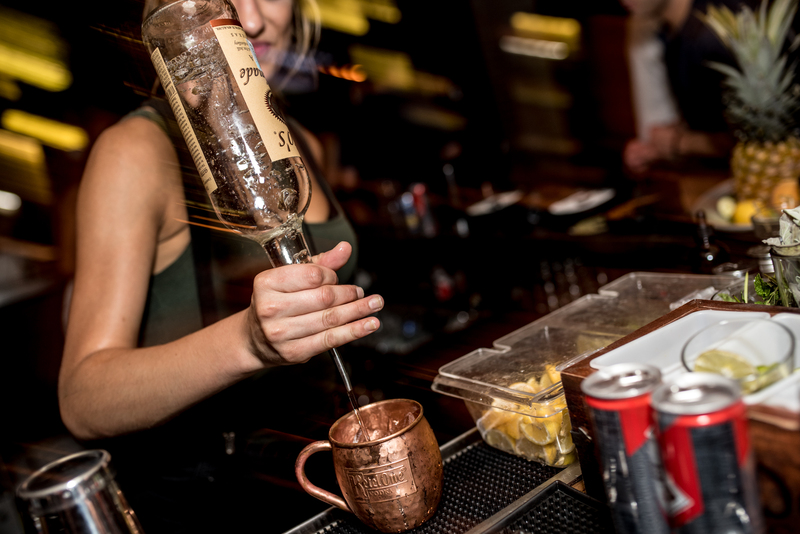 It’s got beautifully made libations, a welcoming environment (hence the name), and breezy patios (both upstairs and downstairs). And, oh yeah, the place turns into a nightclub on the weekends. One of Next Door’s most interesting attributes is a speaker wall. Atmosphere: On a weeknight (except Mondays, when they’re closed), you’ll find a laid-back, comfortable environment: couples and small groups eating dinner and enjoying pretty cocktails in a well-lit space that’s not too loud or busy. Vinyl records intersperse with bottles of wine and liquor on the shelves behind the bar. Dozens of door knockers decorate the wall leading up the stairs. 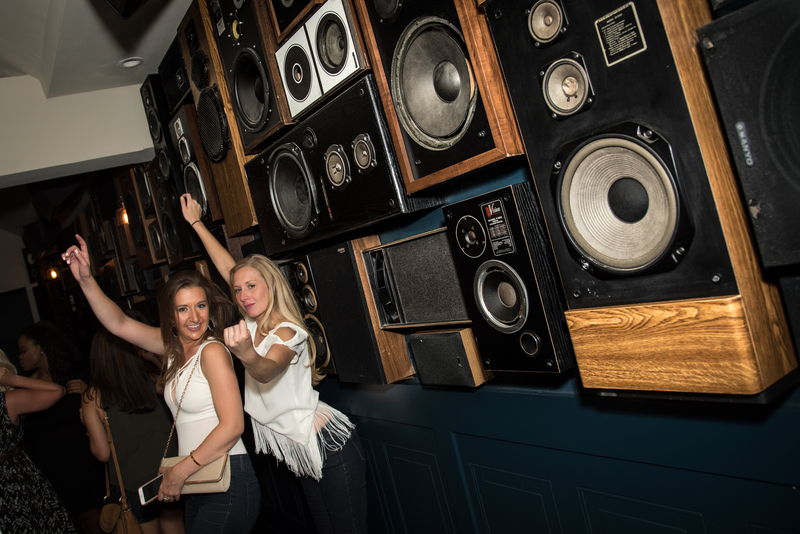 The upstairs, which opens when the club transforms from neighborhood watering hole to wall-to-wall party, features bottle-service seating, a patio with a great view of McKinney Avenue, and a speaker wall (which is just that: a wall full of speakers). The bar is fairly laid back throughout the week but turns into a nightclub on the weekends. What to Order: Next Door has a full-page wine list and plenty of bottle service offerings … but it also has some cocktail cred. There are four options on the “Bubbles Concepts” section (if you’re in the mood for something light and summery), a handful of “Contemporary Concepts” (mostly fruit-heavy drinks with names like Pink Peonies and Scorched Peach), and a couple of drinks on the “Spirit Forward” section (think: whiskey). If you’re hungry, the dinner menu offers a selection of gourmet salads, soups, appetizer plates, and pizzas. The bar has a full-page wine list and plenty of bottle service offerings. Who’s There: The place seems pretty low-key during the week, so expect all kinds: shorts and flip-flops, dressed-down couples out for a bite to eat, and ladies enjoying a nightcap before heading home. It’s truly a bar for anyone—till the party starts. Then you should expect a dolled-up clubbing crowd (Next Door has a dress code after 9 p.m.), Thursday through Sunday. After about 11 p.m., one bartender told me, the place is packed. Sundays feature “party brunch,” which features an early deejay plus menu offerings like French toast bread pudding and the Passion Fruit White Sangria cocktail. What I Didn’t Like: Next Door is such a (relatively) narrow space that it’s not difficult to imagine it packing to the point of uncomfortable pretty quickly on the weekends. What I Did Like: The downstairs patio is adorned with mirrors and columns of foliage. Greenery and shiny things are pretty much my décor of choice.